I am sad to say that the results of this election have not gone my way. I offer my congratulations to Judge-Elect Danielle Gibbons, and my deep thanks to all those who supported me. I am proud of the campaign that I ran, and remain resolved to continue my life of public service. 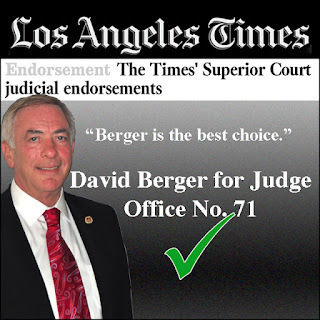 Sunday's LA Times, which has it's largest circulation, renewed it's endorsement for David Berger for Judge, Office No.71. Coming just 2 days before the June 5, Primary Election, this endorsement is a tremendous boost for my campaign. 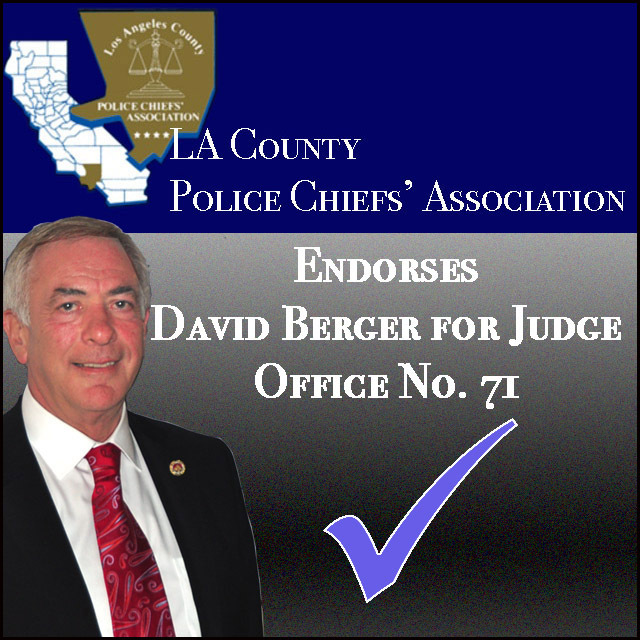 "An impressive criminal prosecutor, Berger has the experience and demeanor required of a good judge." The Times said. To see all the Times' Endorsements CLICK HERE. I am very proud and deeply honored to announce that the brave women and men of the El Segundo Police Officers Association have endorsed me for Judge of the Superior Court. There are just 5 days to go before Election Day, and the momentum keeps building. 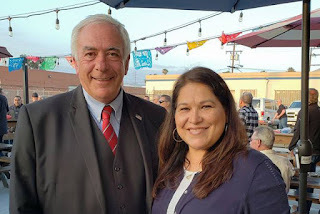 I am very proud and delighted to announce that Hawthorne City Councilwoman Angie Reyes English has endorsed my candidacy for Judge of the Superior Court, Office No. 71. Thank you Angie, for your enthusiasm, support, and encouragement. 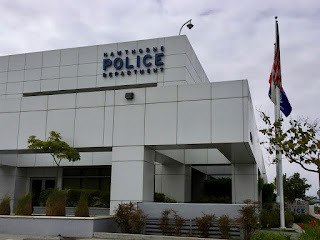 The City of Hawthorne is one of several cities within the jurisdiction of the Airport Courthouse where I work. 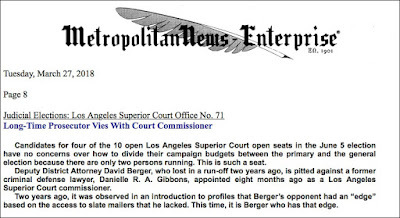 Today I was delighted to learn that I had received the endorsement of the Los Angeles Metropolitan News-Enterprise - one of the leading legal daily newspapers, widely read in the legal community. I had hoped for their endorsement as they had endorsed me in 2016, but I did not take it as a given. 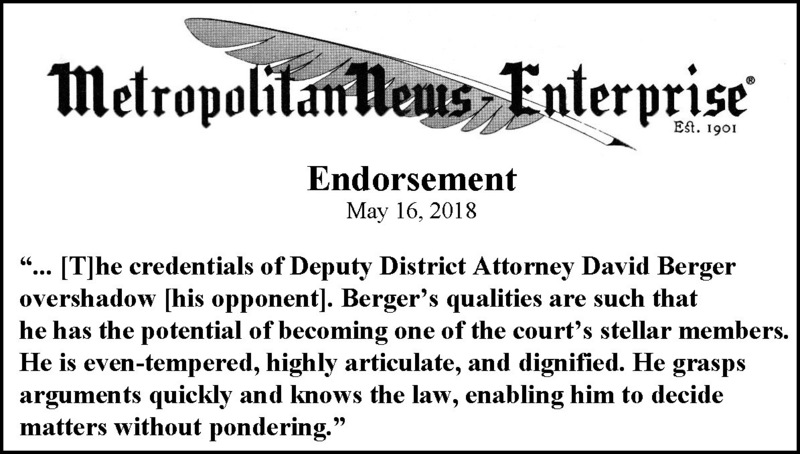 What I did not expect were these incredibly humbling words "The credentials of Deputy District Attorney David Berger overshadow [his opponent]. 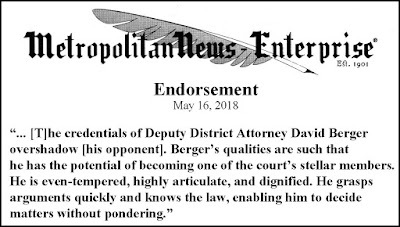 Berger’s qualities are such that he has the potential of becoming one of the court’s stellar members. He is even-tempered, highly articulate, and dignified. He grasps arguments quickly and knows the law, enabling him to decide matters without pondering." Thank you Mr. Grace for your faith and trust. 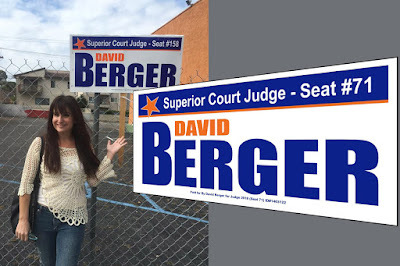 If I am fortunate enough to be elected Judge of the Superior Court, Office No. 71, I will do my best to live up to your expectations. 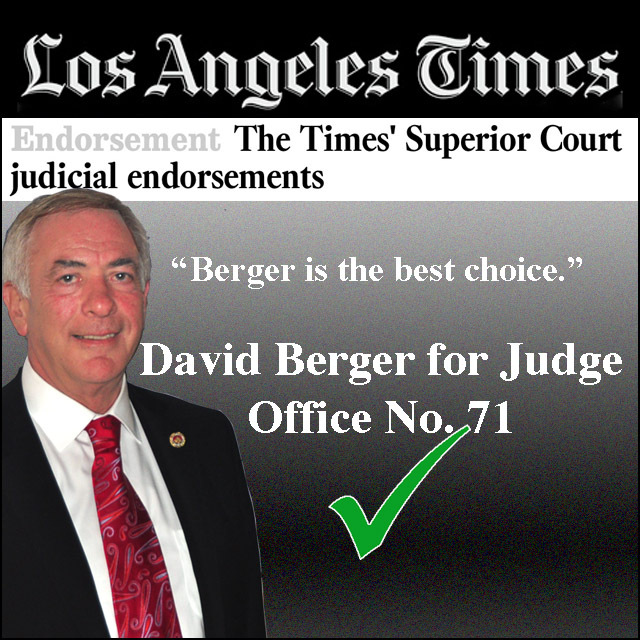 I am very proud and honored to be endorsed by the Los Angeles Times in my race for Judge of the Superior Court, Office No. 71. 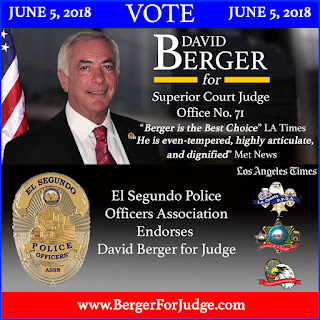 Supporters will recall that in 2016 I was also endorsed by the LA Times, and I am certain that the Times endorsement contributed greatly to my garnering 1.3M votes and brought me just 3% short of victory. 2018 is a different election with a different opponent, but the Times' faith in my candidacy remains a constant, and I believe will tip the balance in my favor in the June 5, 2018 election. "This is the second time Deputy Dist. Atty. Berger has run for judge, and the second time he wins The Times' endorsement for his impressive record as a trial lawyer. 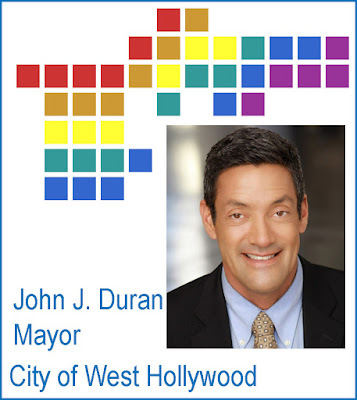 Outside the courtroom, he has a reputation for sharp-witted candor and a sometimes supercilious attitude, which he displayed as a candidate for Los Angeles city attorney and later on a website that critiqued various candidates and commented on news events. None of that gives us pause. 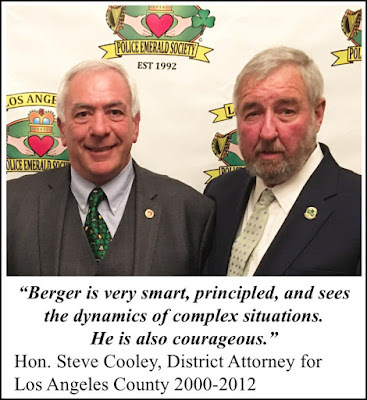 In the courtroom, he has demonstrated himself to be a professional if somewhat tough criminal prosecutor … we recommend Berger." 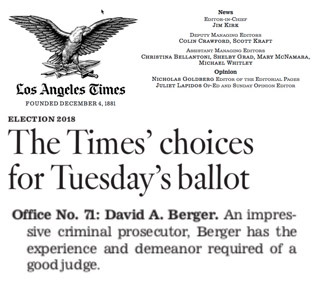 My thanks to the LA Times Editorial Board for their thorough research and balanced reasoning in once again saying "Berger is the Best Choice." With just 5 weeks to go before Election Day, I am delighted to announce that I have received the prestigious endorsement of the Los Angeles County Police Chiefs’ Association. 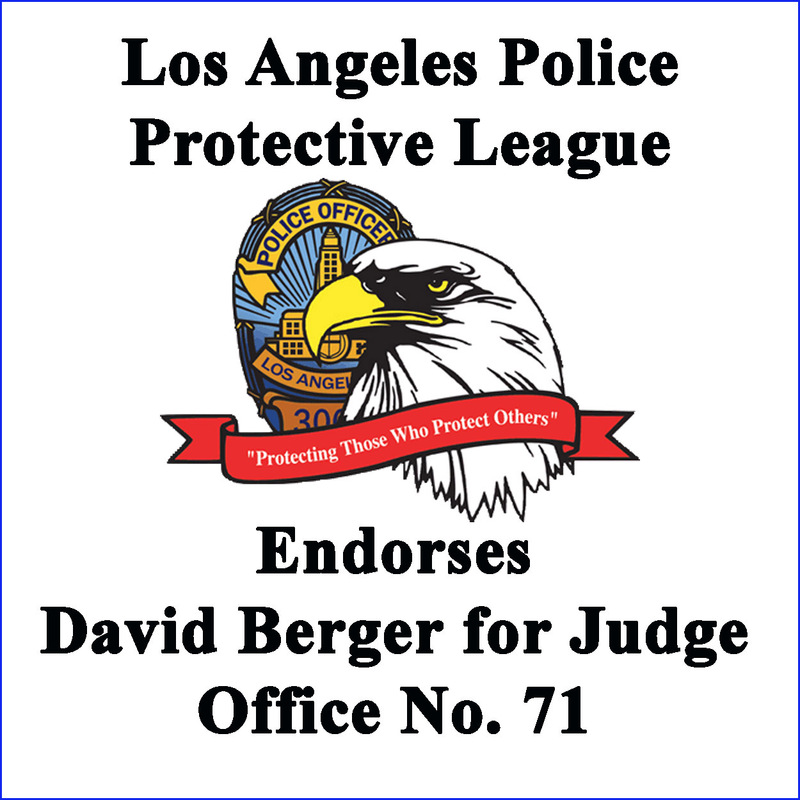 The Los Angeles County Police Chiefs’ Association is a nonprofit mutual benefit corporation consisting of the Police Chief Executives of the 45 independent cities in Los Angeles County. 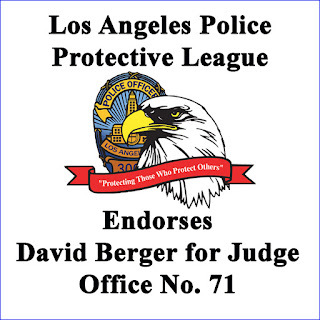 The Association focuses on advancing the science and art of police administration and crime prevention in Los Angeles County; coordinating the implementation of law enforcement efforts by local law enforcement leaders; and developing, teaching, and disseminating professional law enforcement practices. I am very proud and honored to announce that the Association of Deputy District Attorneys (ADDA) has endorsed my candidacy for Judge of the Superior Court, Office No. 71. 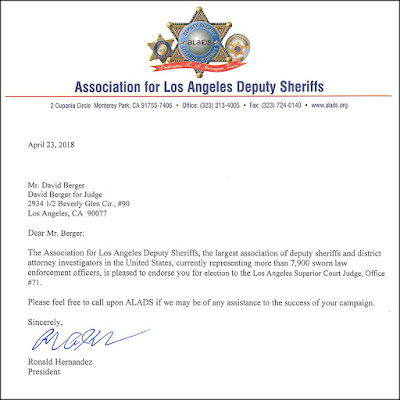 The ADDA is the professional association for the deputy district attorneys (DDAs) of Los Angeles County. 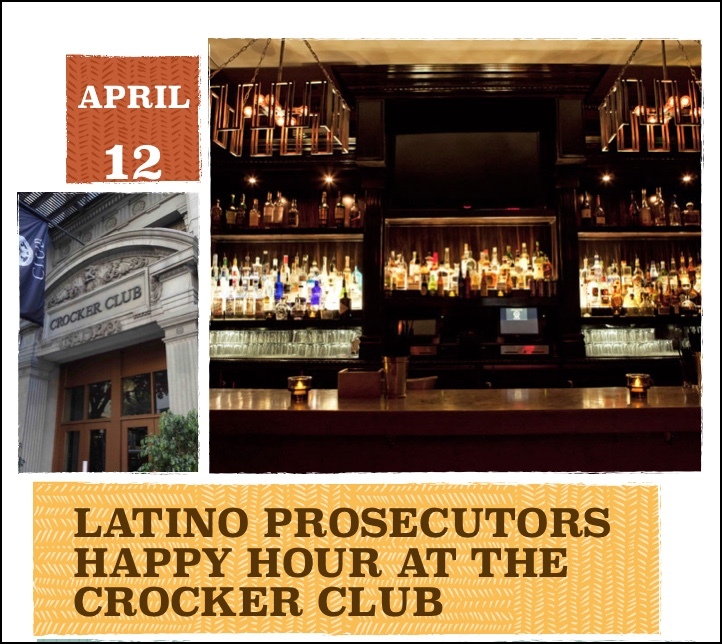 The ADDA strives to advance a work environment that allows it’s nearly 1,000 members to focus on their role as the primary guardians of justice in the courts. 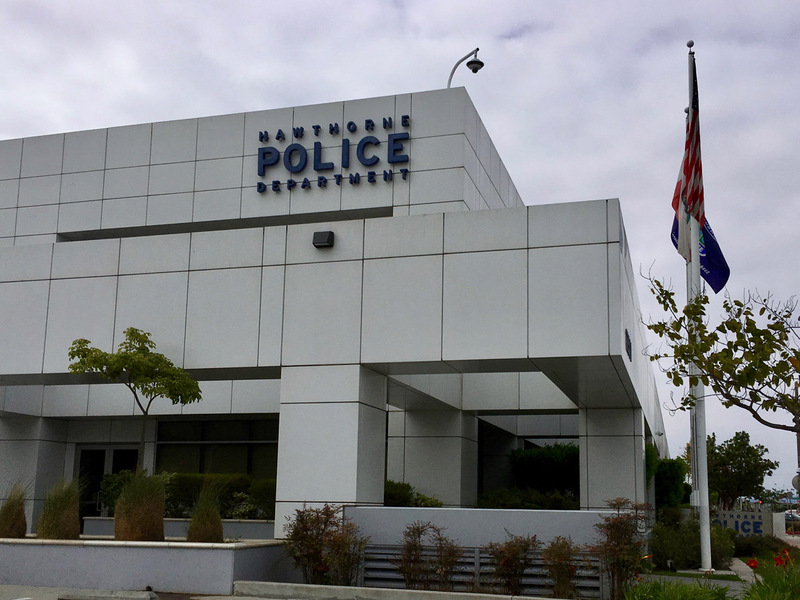 Los Angeles County is home to over 10 million residents, many of whom become victims of crime — while out on the street, or in a car, or at home. 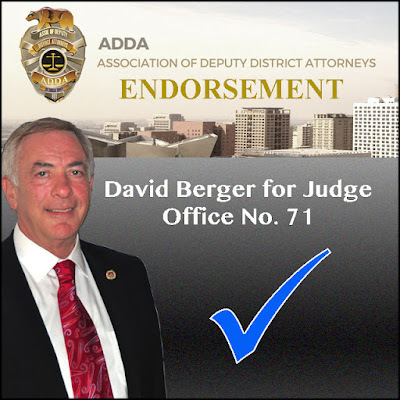 Working with law enforcement, ADDA members handle thousands of cases for filing consideration and prosecution in court, and represent the People of the State of California. 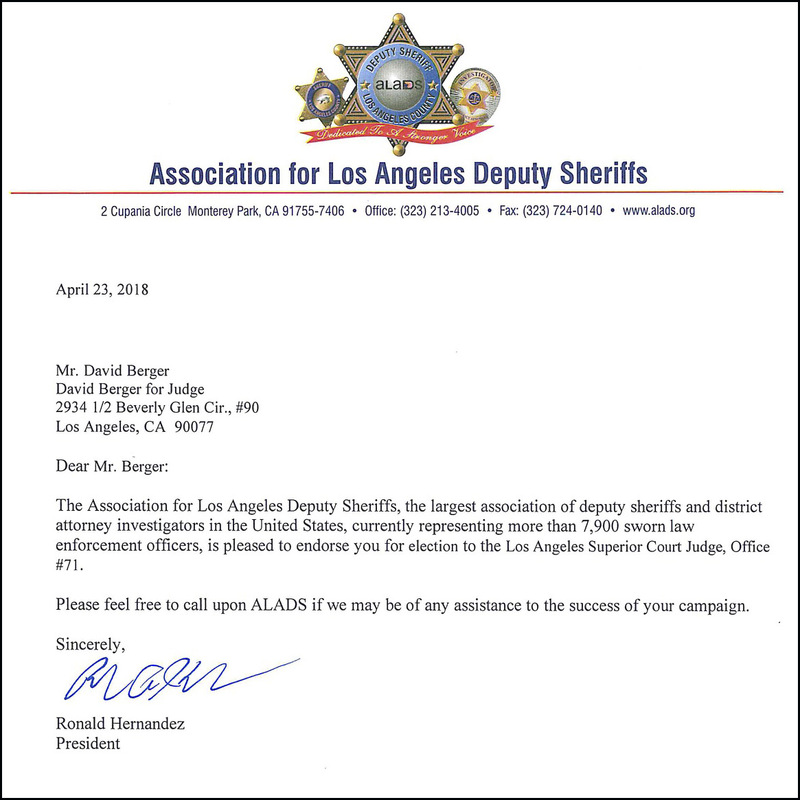 The goal of ADDA members is to seek justice. Justice for victims. Justice for the innocent. Justice for the guilty. Justice for all. 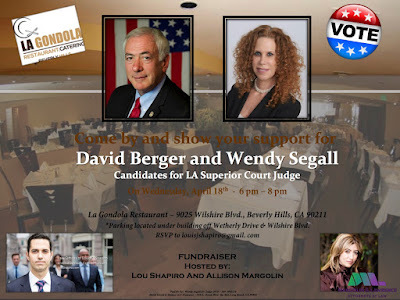 Attorneys Lou Shapiro and Allison Margolin have kindly agreed to co-host a fundraiser for me and my fellow Deputy District Attorney Wendy Segall (candidate for Office No. 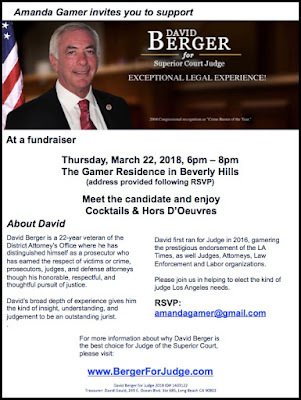 20) on Wednesday, April 18, 2018 from 6pm to 8pm at La Gondola Restaurant, 9025 Wilshire Blvd., Beverly Hills. I have known Wendy Segall ever since I became a Deputy District Attorney, and I am honored and proud to share this event with her. My deepest thanks and gratitude to Amanda Gamer for hosting a fundraiser for my campaign on Thursday, March 22, 2018 at private residence in Beverly Hills where cocktails and hors d'oeuvres will be served. 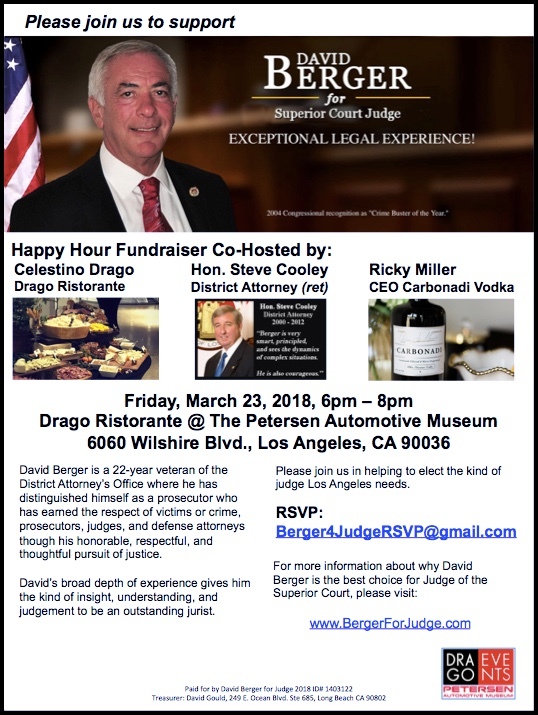 Celestino Drago has kindly offered to co-host a fundraiser for my campaign at Drago Ristorante at the Petersen Automotive Museum on Friday, March 23, 2018 from 6-8pm, together with co-hosts former Los Angeles County District Attorney Steve Cooley, and Ricky Miller, CEO of Carbonadi Vodka. We hope you can join us to enjoy some excellent food, vodka, and company in the beautiful surroundings of the Petersen Automotive Museum. 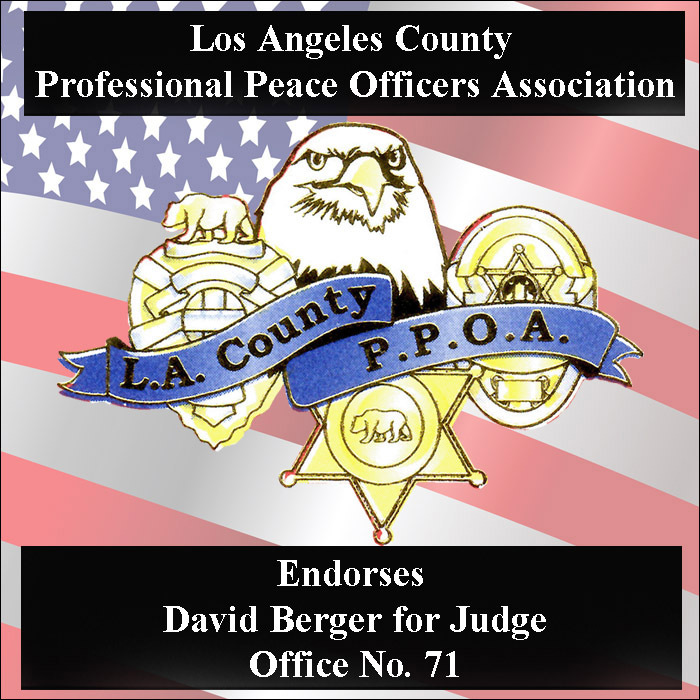 I am very proud and deeply honored to announce that the Los Angeles County Professional Peace Officers Association has endorsed my candidacy for Judge of the Superior Court, Office No. 71. 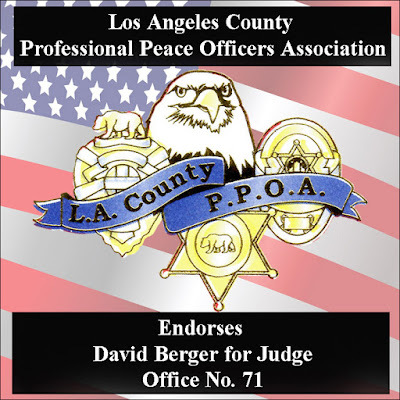 The PPOA represents more than 8,700 law enforcement professional in the County of Los Angeles and are dedicated to providing the best in public safety to the communities they serve. 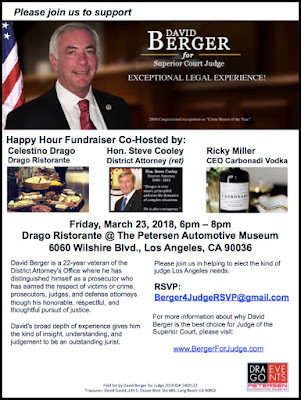 It was a privilege for me to serve as a Deputy District Attorney during Mr. Cooley's historic 3-terms as LA's District Attorney. I will never forget sitting in the assembly hall at the Hall of Administration where the Board of Supervisors usually sits. It was where our Saturday seminars were held. On a Saturday morning following Mr. Cooley's swearing in, he took a few moments to introduce himself to address us; the rank and file line deputies. 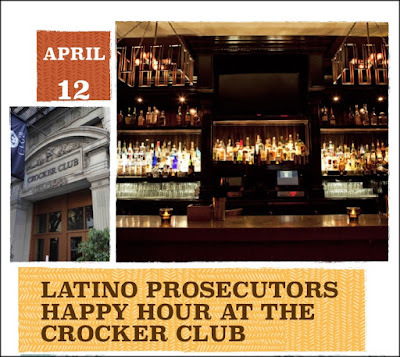 He started by introducing us to the members of his new administration, and spoke about some of his goals such as establishing the Public Integrity Division to investigate and prosecute corruption by elected officials, and the Justice System Division to similarly root out corruption in the legal profession. He spoke also of a policy to change the way that Third Strikes cases were to be treated so as to avoid unduly harsh sentences. These were exciting times. But the one thing that stood out in my mind above all else, was what Mr. Cooley told us he expected of us; "Do the right thing." Those simple four words became my mantra as my career as a prosecutor progressed. It is a mantra I will take with me if I am fortunate enough to be elected Judge of the Superior Court. So my thanks are not just to Mr. Cooley for his endorsement, but also to Mr. Cooley for being a great leader and inspiration. 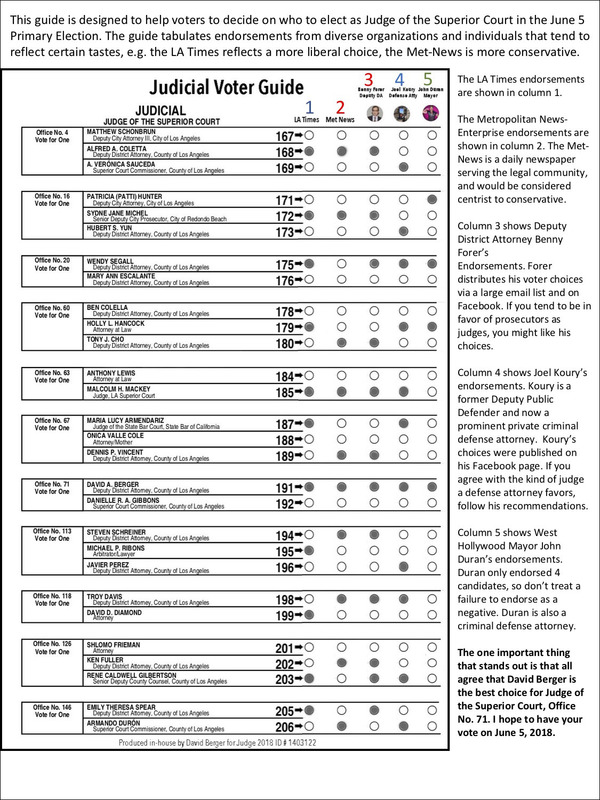 This year the Judicial Elections are markedly different from 2016 when there were only 4 open seats (also known as 'Offices'). When the deadline for filing closed this year, there were 10 open seats. An 'open seat' means a seat where a judge has decided to retire and vacate his or her seat to allow voters to decide on a successor. 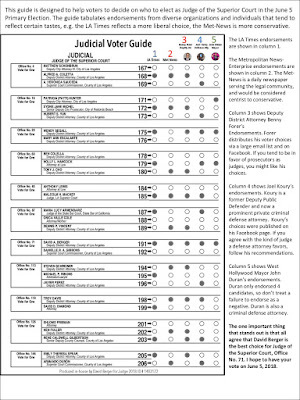 I had initially chosen Office 126, however, that soon filled up with 3 other candidates. Based on my 2016 experience, I decided to file my candidacy in Office 71 where I will face only one opponent. This choice means that my campaign will be over on June 5, 2018, as where there are only 2 candidates, the candidate with more than 50% of the vote wins the election. In seats with more than 2 candidates (such as Office 126), the top 2 vote-getters continue campaigning until the November election. 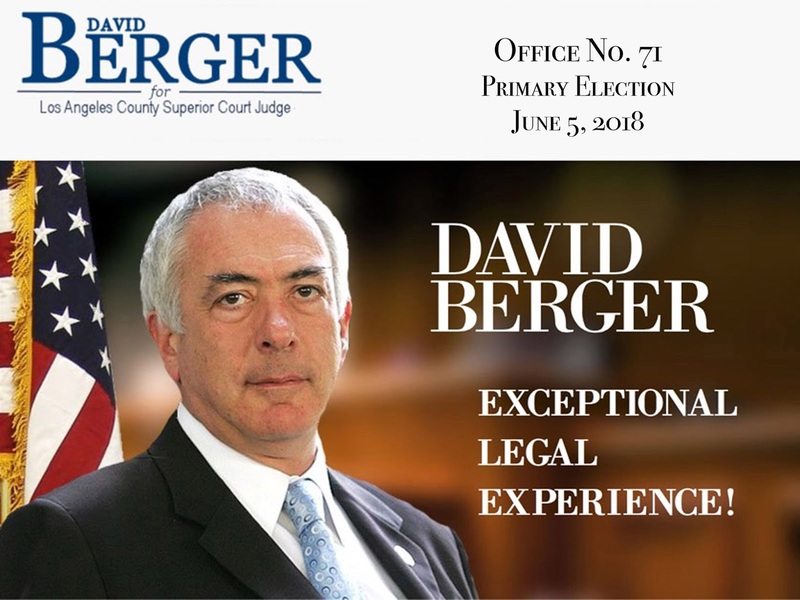 My experience in 2016 tells me that my best chance of winning the election is in Office 71, and that with a little luck, and some hard campaigning, the voters will chose David Berger for Judge on June 5, 2018. 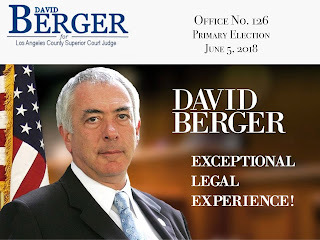 I hope you agree and will spread the word to your friends and family: Vote David Berger for Judge, Office No. 71. 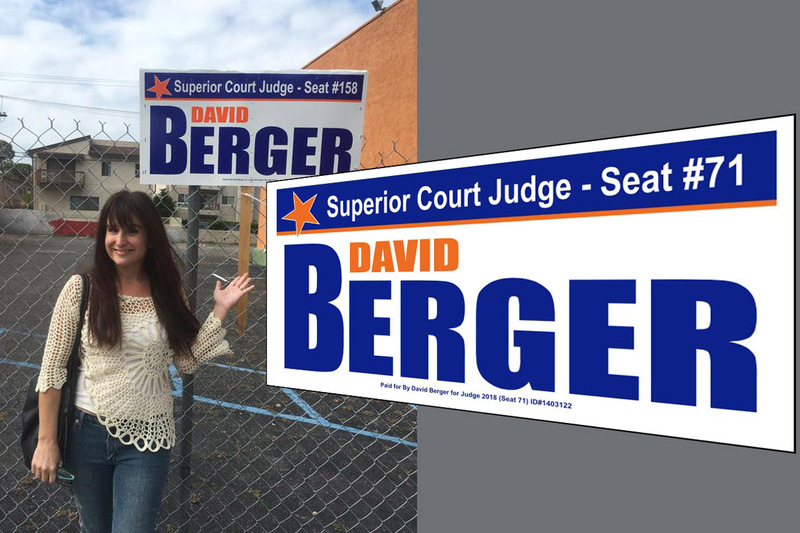 Yesterday I took the first step in the long road to the June 5, 2018 Primary Election for Judge of the Superior Court by filing my Declaration of Intent to run for Office No. 126. I will use everything I learned from my 2016 campaign to turn that experience into a roadmap for success and a seat on the Los Angeles Superior Court. I am so very grateful for the supportive comments many of you sent to me in response to my announcement a couple of days ago, and I am hopeful that you will help me maintain that momentum by sharing this news with your friends and family, adding whatever words you feel appropriate to convince them to support my candidacy in the election.